(Jerry Larson | for The Salt Lake Tribune) Tyler Rowley pushes his daughter, Mykari, 4, as her mother, Courtney, looks on outside their travel trailer, Thursday, August 31, 2017, in Clifton, Texas. The family left Utah after Tyler Rowley lost a mining job and struggled to find permanent work that paid as well and was near their home in Castle Dale. When Angela Arnold was laid off at the end of last year, she didn’t know if she would find work that would let her stay in Carbon County. But then she got a job that keeps rural workers home by design. With training and support from a new company, Accelerant BSP, she answers calls from her house for HealthEquity, a Draper-based health savings account firm that manages over $5 billion for more than 3 million customers. “The idea is ultrasimple: Create rural jobs while filling the needs of the urban company that can’t find adequate talent on the Wasatch Front,” said Joel McKay Smith, CEO of Accelerant Business Solutions Provider. Even though she took a 50 percent pay cut, Arnold, 43, considers herself fortunate to have a steady job with benefits. As the economy in Utah as a whole expands, job losses have devastated some rural counties. Gov. Gary Herbert hopes to see more solutions like Accelerant BSP during his push to create 25,000 jobs off the Wasatch Front in the next four years. While the governor has heralded the rural push as unprecedented, there’s no clear path forward, and success might not be enough to reverse the trend. Creating 25,000 jobs in those counties would represent the smallest amount of job growth in any consecutive four-year period this century, outside the Great Recession. From 2004 to 2008, before the recession settled in, rural Utah grew by more than 32,000 jobs. From 2012 to 2016, the counties grew by more than 27,000 jobs. Economic analysts in the governor’s office said that the goal of 25,000 jobs is ambitious, but achievable, and takes into account the possibility that economic growth of recent years might not continue. It may be easy to create 25,000 jobs in places like Washington and Summit counties, concedes Lt. Gov. Spencer Cox, who is in charge of the 25k Jobs Initiative. But the plan aims to stimulate growth everywhere, he said. By early next year, rural economic development officials will give the governor’s office their plans for growing jobs. At this point, there’s no funding earmarked for those efforts. (Jerry Larson | for The Salt Lake Tribune) Courtney Rowley, her daughter, Mykari, 4, and husband, Tyler Rowle,y prepare dinner inside their travel trailer, Thursday, August 31, 2017, in Clifton, Texas.The family left Utah after Tyler Rowley lost a mining job and struggled to find permanent work that paid as well and was near their home in Castle Dale. Many people in Utah’s rural counties struggle to find new jobs after coal mines or oil drilling sites close down. “We had eight coal mines open 15 years ago; we now have two. We lost 300 to 400 coal miners,” said Jordan Leonard, economic development and tourism director for Emery County, which has a labor force of about 3,000. Leonard said the closures also affected workers in related businesses, such as coal mine repair companies, welders, mechanics and other contractors. New opportunities can’t come fast enough for some residents. Until 2011, Rowley worked in outside sales for a coal mine where her husband, Tyler, was a miner. They made good money, and Rowley was expecting a baby girl. Then, just a few months after they bought a new house, Tyler Rowley lost his job. Rowley became sick from the stress and gave birth to her daughter more than 10 weeks early. For years after he was laid off, Tyler Rowley could find only temporary jobs that paid much less than the coal mine had. Sometimes he would have to work so far away that he could come home only on weekends. Last month, they decided to make a change. Tyler Rowley got a job as a structural welder in Clifton, Texas, where the couple now live with their 4-year-old daughter in a 28-foot trailer behind their Chevrolet Silverado. Rowley misses her two adult daughters, friends and community in Emery County, but said this is the only way to keep her family together and make a living. The couple are still paying off a house in Castle Dale and Rowley hopes that, one day, the famiily will be able to afford to go home. Economic development leaders are focusing on industries other than natural resource extraction, looking for alternatives that won’t leave a town depressed when markets shift. The need to help counties diversify is part of the inspiration for the initiative. Born and raised in Roosevelt in Duchesne County, J.R. Bird, 38, founded Paragon Oilfield Products to sell supplies to drilling companies. Within the first year of business in 2008, the company’s revenue and payroll grew to 10 times their original size. But, in 2009, the global economic crisis hit and Bird’s monthly revenue shrank by about half. He was able to make it through until the next, bigger crisis hit in 2015. The market remains weak. Bird took a 50 percent pay cut to stay in business and encouraged employees to take any other job offer they could. Bird diversified by shifting to sell piping to municipalities, the Utah Department of Transportation and agricultural producers in the area for the construction of drainage along roadways and for irrigation systems. His business has not completely rebounded, but he is profitable and has hired back some of his former employees. Not only did more than 2,000 residents lose their jobs when the natural resources industry sagged — but the Uinta Basin also lost more than $3 billion in drilling budgets spent by natural resource firms in the area, said Irene Hansen, executive director of the Duchesne County Chamber of Commerce. As part of the 25k Jobs Initiative, service providers from the Wasatch Front are visiting each rural county to help connect local business with resources and to listen to what they need. Some officials promote tourism as a way to profit off the state’s other natural resources. “Building out a better infrastructure to support a tourism economy is something I think will be up for consideration,” said Derek Miller, president and CEO of the World Trade Center Utah, a partner organization for the 25k Jobs initiative. But in counties that rely heavily on tourism, local officials warn about the shortcomings of the industry. In Garfield County, home to Bryce Canyon and Capitol Reef national parks, the number of people working in the accommodation and food services sector increased during the past 10 years by about 30 percent at the height of the season. The sector accounts for about half the county’s workforce, according to DWS data. But those jobs are some of the lowest-paying in the county, and residents can’t rely on them all year. Other than tourism, Fischer said, attracting new businesses is nearly impossible because the county lacks freeway and rail access that many employers consider vital. In other rural Utah counties, local officials say they have no hope that their small communities can attract new businesses. “We don’t have the infrastructure and we certainly don’t have the manpower to do the recruiting,” said Piute County Commissioner Darin Bushman. Piute County has a population of 1,466, and about 230 of those residents work, according to Census and DWS data. 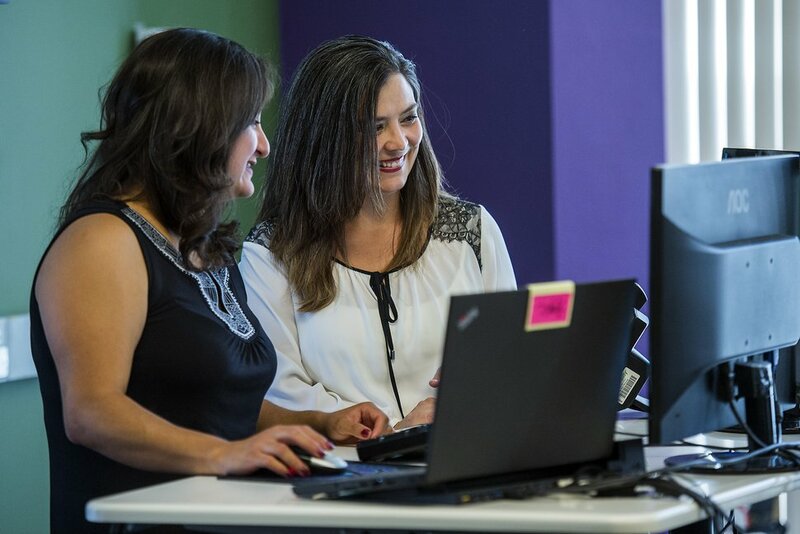 (Chris Detrick | The Salt Lake Tribune) Angelic Sanchez, left, an assistant team leader with Accelerant Business Solutions Provider, talks with remote worker Angela Arnold in the Price business. In Carbon County, Accelerant provides a new alternative to the traditional job opportunities in rural Utah. Arnold was one of 40 people HealthEquity hired in Carbon County this year to answer customers’ calls. Accelerant provided each employee with a computer, two monitors, a phone and $50 a month toward a home internet connection. Accelerant recruits qualified local candidates and to train them, it rents a portion of a government building. But the company plans to move into the old J.C. Penney building, more than 30,000 square feet that housed the retailer for 105 years until it shuttered last year. HealthEquity, now in the process of hiring another 50 employees, was the first company Accelerant brought to Price. Additional companies are expected to offer more jobs soon. Utah’s tech industry will closely watch the endeavor, according to Clint Betts, executive director of Silicon Slopes. “If it works for HealthEquity, you’ll see every company trying to do it,” Betts said. As Accelerant grows, Smith hopes to support local entrepreneurs as well. The J.C. Penney building will have room for light manufacturing, co-working space and a business incubator. Accelerant hopes to create up to 300 jobs there and would like to expand to 22 other counties. Eight of the 10 rural economic development officials surveyed by The Salt Lake Tribune said they wanted to develop remote work possibilities. As officials with the rural jobs initiative visit Juab County on Tuesday, they will announce the Utah K-16 Computing Initiative, which will help rural schools and districts build computing programs. But rural Utah will need to improve technology infrastructure to “develop a 21st-century economy,” said Don Albrecht, director of the Western Rural Development Center, which works on rural economic development in 13 Western states. “The smartest investment would be to get high-quality internet, high-quality information technology in these places,” he said. Arnold said Accelerant’s opening gives her hope for her hometown.